When I wake, I wonder about what has transpired. It seems so unreal. But I see the carcass of the crocodile, floating in the moat, nearly out of the garden now. It reminds me of the reality of it all. I sigh heavily and suddenly feel Him beside me. He is still here with me. Although I am not so surprised by that anymore, I still feel relieved to know that I am not alone. He does not speak, but rises to His feet, helping me to mine. Putting His arm around me, we walk quietly to the front of the castle. The water in the moat is clean now, clear and sparkling, as though nothing had ever polluted it. It is hard to believe such a transformation could happen in such a short time. I marvel at the completeness of it all. In the waters, small koi dart about, filling the once foreboding moat with colorful life. There is a drawbridge over the moat to the castle. The bridge is only half way down. Neither up nor down, it seems ambivalent, neither welcoming nor directly turning away those who seek entrance. We cannot cross. I know we could easily ford the moat; without the monsters guarding it, the moat is no longer a formidable obstacle. Yet, it seems clear that is not the way He desires to enter in. “How do we cross this?” I wonder aloud, feeling tired and discouraged. Clearly the bridge is controlled from inside. I cannot see how to get around this. A flood of relief washes over me! After all that I have fought through so recently, it seems almost unbelievable that this part can be so easy! For a brief moment I am tempted to question Him, but I do not want to risk losing the simplicity of this answer. I turn to Him. “Please, Papa, come cross the bridge with me. Come into the castle, I want you here.” I quietly say, voicing the true desires of my heart. Just behind me I hear a gentle creak of wood. I look and see that the bridge has fully lowered, allowing us accessing into the inner walls. I stand just looking for a long time. I have wanted this for so long, but now it seems difficult. Excuses and distractions rise around me and I begin to wander away. I am not sure how long I wander, but I suddenly He is not at my side! Panic rises for a moment, but soon I realize that I know where I am and I know the way back. The path back to Him is not difficult; the obstacles have already been dealt with. I rush back to Him. He is there, patiently waiting for me to find my way. I look at the bridge again, “Must we do this?” I have to ask. This would be so much easier if He would press me, insist, if He would just make me! Even though I want this, taking that first step is difficult. He offers me His arm. Hesitantly, I entwine mine in His. He lets me take the first step. The bridge is easy to cross; there are no obstacles, no monsters here. As we reach the other side, I am surprised. 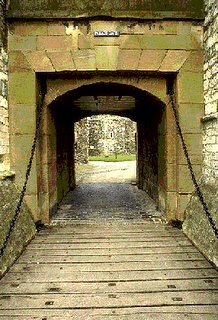 I had expected to enter into the castle directly, but as we cross the bridge and pass through the wall I see an open, barren court yard. The yard is eerily empty, it should be full of life. I do not know how I know this, but I am certain it should. “Why is this so empty?” I ask Him, pausing to look over the stark expanse. “You have not invited anyone here in a very long time.” He is right, I have been alone here, alone for as long as I can remember. “Do not fear, though, this is not an obstacle either.” He reassures. The inner walls that define the court yard are built from stones, rising about ten feet high. The castle sits in the corner of the two back walls. It is unusual, though, in that the castle and the courtyard seem to be more diamond shaped than square, with both the front door of the castle and the bridge in the walls sitting in the front corner of the structures, rather than flat in a wall. To the right and left of the castle door there are small pockets formed by one castle wall and the courtyard wall. Although they are empty, these seem like places that should be planted. I am once again struck with the fact that I can see no plant, no creature living here. We walk across the courtyard to the front door of the castle. The door is tall and wide, carved from mahogany, but it is covered with dust and grime. Clearly the door has not been opened in a very long time, if ever.